Printed in the 1800's, original engraving (8" x 11") by Johnson, Fry N.Y. This came from the Herzog and Co. / R.M. Smythe archives when they were relocating their offices in Manhattan. This engraving would look terrific framed. William Moultrie (November 23, 1730 � September 27, 1805) was a general from South Carolina in the American Revolutionary War. Moultrie was born in Charleston, South Carolina. He fought in the Anglo-Cherokee War (1761) and served in the colonial assembly before the advent of the American Revolution. 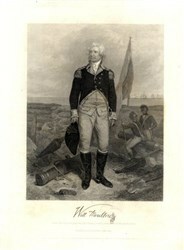 In 1775 he was commissioned colonel of the 2nd South Carolina Regiment. In December of that year he led a raid on an encampment of runaway slaves on Sullivan's Island, killing 50 and capturing the rest. In 1776 his defense of a small fort on Sullivan's Island (later named Fort Moultrie in his honor) prevented Sir Henry Clinton and Sir Peter Parker from taking Charleston, South Carolina. The Continental Congress passed a resolution thanking Moultrie. He was promoted to brigadier general and his regiment was taken into the Continental Army. Moultrie's skill failed to prevent the fall of Savannah, Georgia to the British in 1778. He was captured in the fall of Charleston to the British in 1780 and later exchanged. He was promoted to major general in 1782, the last man appointed to that rank by Congress. After the war he served as the 35th Governor of South Carolina (1785�87, 1795�97). He wrote Memoirs of the Revolution as far as it Related to the States of North and South Carolina (1802). After the war, the fort he had defended was renamed Fort Moultrie, continuing to function as a pivotal defense point until supplanted by Fort Sumter. During his famous defense of the fort that would someday bear his name, a flag of Moultrie's own design was flown: a field of blue bearing a crescent with the word LIBERTY on it. Shot down during the fight, then held aloft by a Sargent William Jasper to rally the troops, it became iconic of the Revolution in the South. It came to be known as the Moultrie Flag, or the Liberty Flag, and was incorporated in the Flag of South Carolina, as well as being used alongside the Gadsden flag in the modern liberty movement.